When it comes to self storage, renters want to protect their belongings... but have customers considered protecting Earth, our most valuable possession? 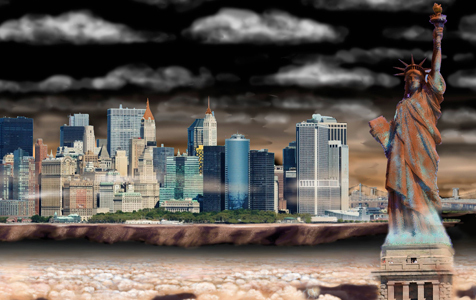 What if you took New York City and placed it on another planet? Life as we know it would cease to exist. Although we rarely think about our infinite universe, the fact that we live where we do is a miracle. The following illustrations were made with the help of Marilyn Vogel. She has a Ph.D. in Astrobiology, worked at NASA Ames for five years, and now teaches science at the university level. The descriptions for each of the different planets below were provided by her. Mercury has but a thin envelope of gas that barely qualifies as an atmosphere. The inexorable solar wind continually strips the planet of any gases that might be captured or retained by gravity. The tenuous atmosphere consists primarily of hydrogen making the atmosphere transparent to the darkness of space and the withering radiance of the nearby Sun. The solar wind interacts with the planet’s magnetic field to blast columns of dust and charged particles up into the atmosphere that then become a comet-like tail, evident as the sparkling haze shown in the upper atmosphere. The landscape is perforated with impact craters and covered in volcanic dust, similar to Earth's moon. Due to its prolific volcanic activity, Venus is blanketed in an atmosphere of CO2 with clouds of sulfuric acid. 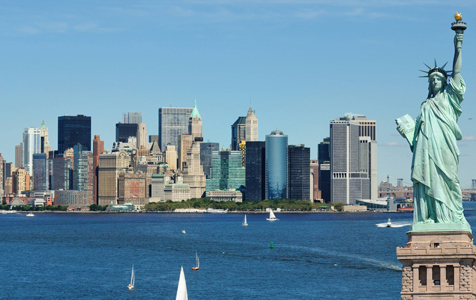 This creates a yellowish envelop of hot, sulfurous air that obscures the NYC skyline and the nearby sun. The landscape is devoid of water and covered by craters, lava, sulfurous dust and other features created by Venus' volcanoes. Mars has an exceedingly thin and cold atmosphere composed primarily of CO2. Mars’ atmosphere has an oxidizing chemistry that converts the abundant iron materials on its surface into various forms of rust, evident as the tawny landscape. Strong convective currents in the atmosphere also stir up frequent dust storms that can cover vast expanses of the planet and last for months. 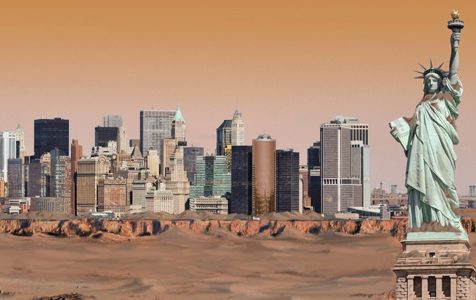 The NYC skyline is thus caked in dust and framed in Mars' dusty red atmosphere. Jupiter is the largest of the outer gas giant planets. Its atmosphere is so large and thick that the hydrogen and helium gas components condense into liquid, and even metallic forms near the base of the atmosphere. 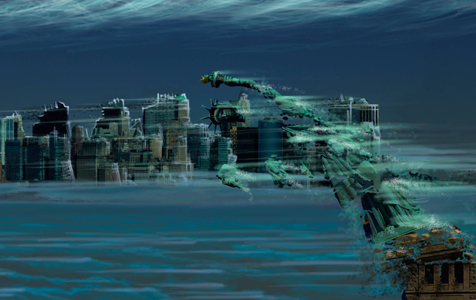 At around 100 km height above this liquid surface, the air has a similar air pressure to Earth’s atmosphere at the surface, but has a reducing chemistry that would burnish any metal surface, including that of the Statue of Liberty. 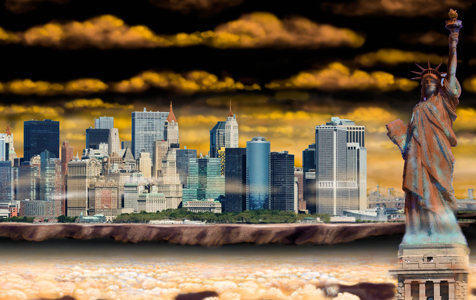 The NYC skyline is depicted at this 100 km level, floating in the atmosphere. This area of Jupiter’s sky is a vast body of clear gaseous hydrogen. NYC is nestled between Jupiter's clouds of water, ammonia and sulfurous gases (the sallow clouds below) that sometimes converge into powerful thunderstorms (seen erupting below). 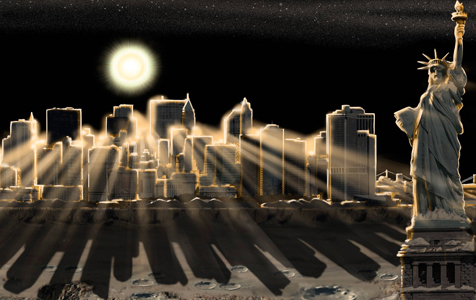 Above the skyline hangs a yellow haze of hydrocarbons. Saturn has a similar atmosphere to that of Jupiter, containing a mixture of hydrogen and helium that condense at the base of the atmosphere. NYC is shown at about 100 km above this liquid surface, where the clear hydrogen resides at similar pressures to Earth’s atmosphere and contains soft cream colored clouds of ammonia ice with occasional thunderstorms (shown below the cloud deck). 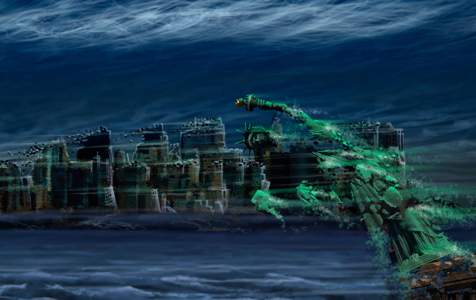 As with Jupiter, the atmospheric gases are highly reducing and would slowly dissolve any metal oxide surface like the green patina that covers the Statue of Liberty. White clouds of ammonia and light hydrocarbons float by above the skyline. Uranus is a cold gas giant that rotates perpendicular to the plane of its orbit. It has very high winds speeds at certain latitudes due to the uneven heating of its surface. These winds are faster than the most powerful hurricane on Earth and would thus obliterate structures like the Statue of Liberty. 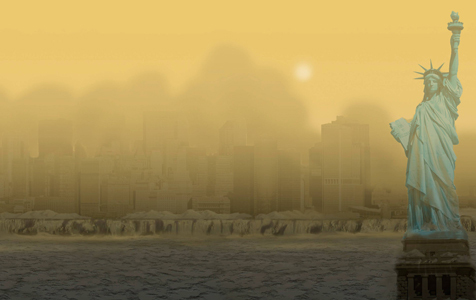 The atmosphere is primarily composed of hydrogen and helium with occasional clouds of methane and bands of hydrocarbon haze, shown as the horse tail clouds above the skyline. The atmosphere also contains a considerable fraction of methane, giving the air a beautiful aquamarine tint. Neptune is the outermost planet of the solar system and thus the darkest. Like the other gas giants it experiences extreme winds that would destroy buildings and other structures. Neptune's atmosphere consists primarily of hydrogen and helium with traces of ammonia and water giving it an azure tint. Ammonium and water ice condensate hangs as light colored cirro-stratus clouds above the skyline. Neptune’s atmosphere is the coldest place in the solar system. Our way of life depends on a set of conditions which does not exist anywhere else on our universe. Let's protect what we have. StorageFront.com is the No. 1 search engine for storage facilities in North America, with more than 2,000,000 annual renters visiting who seek reliable storage units. Why Are Cities Hotter Than Surrounding Areas?